While on a trip to visit the Ijen and Bromo Tengger Semeru volcanoes in East Java last month, Chicago-based photographer Reuben Wu captured the unusual sight of molten sulphur that flows from fumaroles at the base of the Blue Fire Crater at Ijen. The area is usually swarming with tourists, but Wu stayed after sunset until the moon rose to capture these otherworldly images. The journey into the Ijen Caldera is not for the faint hearted. A two-hour trek up the side of the rocky volcano is followed by another 45-minute hike down to the bank of the crater. The blue fire found at the base is the result of ignited sulphuric gas that burns up to 600 degrees Celsius (1,112 degrees Fahrenheit) and can flare up to 5 meters (16 feet) into the air. 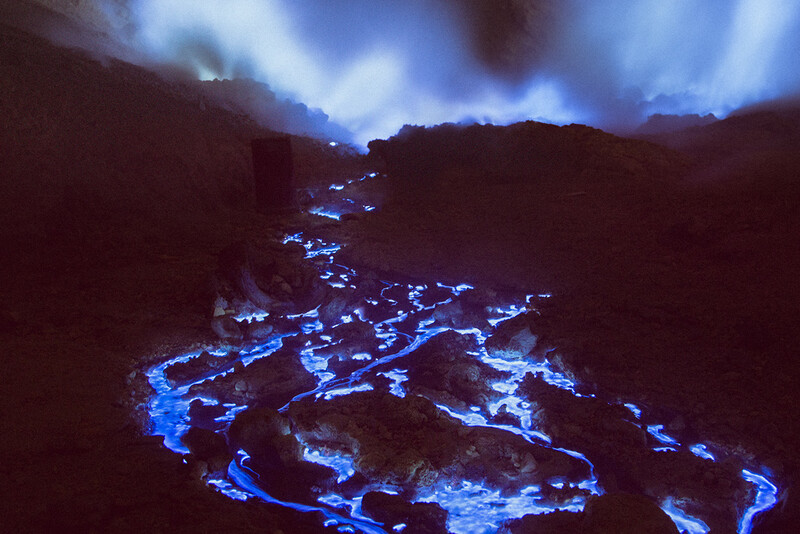 It is the largest “blue flame” area on Earth.